We became human sit­ting round a fire under the stars. We are now burn­ing up the plan­et. We are a mir­acle in the Universe yet we are under­min­ing our sur­viv­al and the sur­viv­al of the Garden of Eden that is our lovely, lonely, liv­ing Planet Earth. This show is a bold, inspir­ing, hope­ful and heart-warm­ing take on the big pic­ture and the step up we must make. 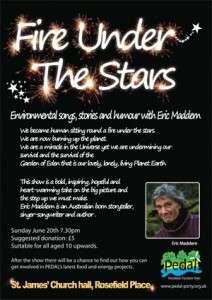 Sunday June 20th 7.30pm. Suggested dona­tion: £5. Suitable for all aged 10 upwards. After the show there will be a chance to find out how you can get involved in PEDAL’s latest food and energy pro­jects. Eric is a great per­former and I’m sure it will be a great event! This entry was posted in carbon reduction, Energy, events, Food. Bookmark the permalink.